There is no shade in the desert of Rich Rodriguez's tenure at Michigan. 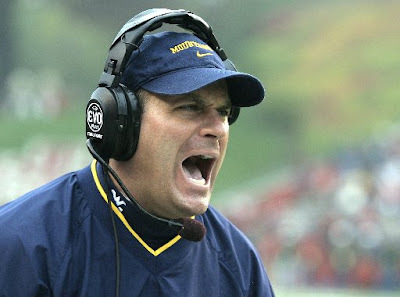 On August 14th Rodriguez meets with the NCAA's committee on infractions to discuss Michigan's self-imposed sanctions. This meeting was already set in stone many months ago when Michigan essentially pleaded guilty to 4 of the 5 infractions found by the NCAA during their investigation last year. Now it seems West Virginia has been found guilty of infractions very similar to Michigan's (too much practice time). 5 "major" infractions were found at West Virginia that stem from Rodriguez's time there, and that carried over into current head coach Bill Stewart's administration, 2005-2009. The latest infractions are unique to West Virginia, and will not follow Rodriguez to Michigan or impact his hearing with the NCAA next week. "I've already said Rich is our coach this fall and WVU's announcement does not change that fact," Brandon said. "We're certainly paying close attention to the situation, but we all need to let the process and the facts unfold before we draw any conclusions. "Our focus is on our program and the start of the football season." Now it stands to reason that since Rodriguez has been found guilty of infractions at Michigan, and there's a smoking gun back in West Virginia, it seems like any dueling investigations would have to connect the dots and overlap. That could spell bad news for Rich when he sits down with the NCAA in 8 days. While one legal expert said this latest revelation should not affect Michigan's appearance before the Committee on Infractions, the committee undoubtedly will know of this latest issue that also involves Rodriguez. "It's going to be that silent person in the room that everyone knows is there but that no one is going to talk about," said Michael Buckner, a Florida lawyer who has represented universities in NCAA investigations. "The committee only considers the case before it -- West Virginia is not before them." Buckner said this latest information should directly affect Michigan's strategy before its hearing. He said it's unlikely U-M brings up the West Virginia investigation either directly or indirectly. "The only way I can see West Virginia coming into the Michigan case is if there are questions for Michigan about when they hired coach Rodriguez, what type of due diligence did they do." I have always taken compliance seriously and have sincerely felt our program was very open and transparent. I regret any mistakes that were made or rules that were misinterpreted. Any errors certainly weren’t made intentionally. I openly discussed my past practices with NCAA investigators and will continue to cooperate fully during this process. I have redoubled efforts with my staff and our compliance team to improve several processes, strengthen communications, and work to ensure these mistakes won’t happen in the future. We have a tremendous program and an exceptional group of student-athletes, and I look forward to an exciting and successful football season. In a time when SEC schools are dealing players out to agents left and right, and USC is getting taken out to lunch by NCAA for not playing ANY attention to boosters giving Reggie Bush Cadillac's and houses in 2003-04, is a little extra practice time (like 20 minutes extra per week) really reason for such in-depth investigations? Look, I get it, he broke the rules. We all break the rules when we drive 5 miles over the speed limit. Is this really cause for such a long and grueling investigation? Maybe I'm just sick of hearing about it and writing about it. Either way, I can't wait for actual football to start being played. This NCAA investigation crap has got to end. Hopefully we can put all this passed us once Denard runs 70 yards for his first touchdown 3 minutes into the home opener against UCONN in 29 days. Nothing will shut up the whimper of the NCAA like a roaring crowd of 109,901 fans on September 4th. WELL SAID! LET'S PLAY THE GAME! !